Hot on the heels of last Sunday’s very wet Preliminary Round the FA Women’s Cup is back for a 2nd success Sunday with First Round Qualifying. 12 ties featuring sides playing in the East with some high scoring wins along the way. 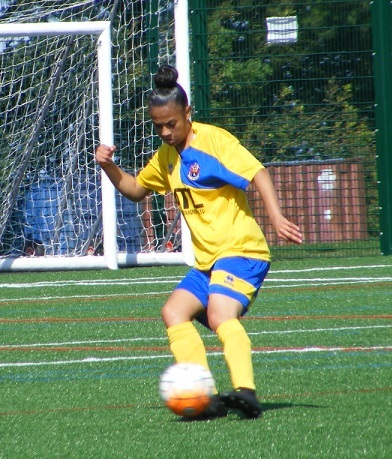 It was a huge scoreline for ERWFL Premier Division side, Cambridge City Ladies in First Round Qualifying as they ran out double figure winners over Cambridgeshire Premiership newcomers, Riverside Ladies on Sunday. Erin Davies netting a double hat-trick top scorer for Cambridge. Both Bronte Rapley and Sofia Castiglione both getting two each. Amy Reed, Laura Mills, Hannah Bodily & Anna Goggin also getting a goal apiece in a 14-0 result. It was double figures too for Royston Town Ladies in First Round Qualifying as the ERWFL Premier Division side proved to be to strong for Division One opponents Bishops Stortford Ladies on Sunday. Royston’s goals spread out amongst the side, Samantha Edgar and Hayley Elderd both scoring a brace the other goalscorers, Danielle Carty, Charlotte South, Paris Coldicott-Stevens, Angharad Chambers, Eva Ramsey, Rebecca Scott & Sammy Tinsley. There were 8 goals shared between Peterborough Northern Star Ladies & Northampton Town Ladies in their First Round Qualifying tie before Peterborough Northern Star clinched victory in the penalty shoot-out. Katie & Cassie Steward, Jessica Driscoll and Bronwyn Mulheron getting the goal for the hosts, Northampton matching that tally extra-time not separating the sides an eventful game finally settled with spot kicks Peterborough Northern Star emerging 3-1 winners to progress to the next round. St Ives Town Ladies progressing to First Round Qualifying with an extra-time winner over Corby Town Ladies were at home again in First Round Qualifying taking on EMWFL Premier Division side Peterborough United Ladies. Another tough test for St Ives, Peterborough strong in the first half Hannah Pendred scoring in the 10th minute to give the visitors the lead. Kier Perkins doubling the advantage to see Peterborough leading 2-0 at half-time. St Ives got themselves a goal back in the 2nd half Caitlin Jarman putting the ball home to make it 2-1. Peterborough held onto their lead to reach the next round. AFC Dunstable Ladies were at home to Watford Ladies Development in First Round Qualifying of the FA Women’s Cup on Sunday. Running out comfortable winners, Storm Sherry Burrows opening the scoring in the 15th minute went on to score again with a goal from Rachel Moffat in between to see Dunstable leading 3-0 at half-time. Moffat adding her 2nd of the tie 10 minutes into the 2nd period, Samaira Khan struck home with 10 minutes left on the clock to make it 5-0. A brace from Poppy Binding the winning goal coming 5 minutes from the end saw Harlow Town Ladies overcome fellow ERWFL Premier Division side, Brentwood Town Ladies on Sunday in reach Second Round Qualifying of the FA Women’s Cup as they ran out 2-1 victors away from home. Lauren Knight scoring for Brentwood. First half goals from Sheree Oliver and Lucy Hancock were enough to see ERWFL Premier Division side, Colney Heath Ladies at home through to the next round of the FA Women’s Cup after they ran out 2-0 winners over opponents Houghton Athletic Ladies, from Beds & Herts Women’s Division One playing their 1st competitve game of the season. Histon Ladies were at home in First Round Qualifying taking on Northamptonshire side, Thrapston Town Ladies this Sunday. The ERWFL Division One side winning for the first time this season to advance into the next round. After a goalless first half, Katie Webb struck early in the 2nd half to put Histon into the lead. Kaya Haqi’s 1st goal for Histon doubling the lead Thrapston Town pulled it back to 2-1 deep into stoppage time. Women’s Football East was at Beccles Town FC last Sunday in the rain to watch Chelmsford City Ladies clinch victory in the Preliminary Round of the FA Women’s Cup to set up a First Round Qualifying home tie against AFC Sudbury Ladies. Chelmsford exiting the competition but by the narrowest of margins against their ERWFL Premier Division opponents as Sudbury won the tie by a single goal Mia Etheridge finding the back of the net to see the Suffolk side progress. Leigh Ramblers Ladies join fellow Essex Women;s Premier Division side Corringham Cosmos in the next round of the FA Women’s Cup with a 2-0 win over higher league opponents Bowers & Pitsea Ladies on Sunday. Leigh Ramblers were making their debut in the competition, defended well as Bowers & Pitsea created chances first half keeping their fellow Essex side at bay Leigh took the lead late in the 1st half. Doubled the advantage from a corner early in the 2nd half and despite Bowers & Pitsea pressing for a reply couldn’t find it as Leigh celebrated victory. One final tie to report on ERWFL Premier Division side, Acle United Ladies travelled to Northamptonshire to play Kettering Town Ladies in their First Round Qualifying tie. A brace from attacker Grace Birchall along with midfielder Amber Rowland netting her first goal of the season saw the Norfolk side safely through the next round with a 3-1 victory. The draw for Second Round Qualifying of the FA Women’s Cup was made on Monday the sides from FAWNL Division One entering the competition. Selected ties featuring sides playing in the East are listed below. Second Round Qualifying ties to be played Sunday 23rd September with the winners receiving £450. Good luck to all. This entry was posted in FA Women's Cup, The Round-Up and tagged FA Women's Cup, The Round-Up on September 4, 2018 by WFEast.